If you are on the hunt for cooking with wine recipes that will feed a crowd, and will delight everyone, Paella is your choice. It is a very versatile dish. And the fact that you can always substitute ingredients, within reason, this recipe is sure to become one of your favorites. 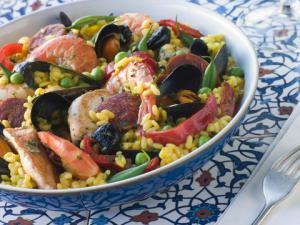 It seems that there are as many versions of paella as there are cooks that have ever made it. You will love this version. Add this to your Cooking With Wine Recipes! If the paella pan is metal, you may use it on the stove top, but if the pan is earthenware, it should not be used on top of the stove, use only it in the oven. paella pan. Heat chicken stock and infuse the saffron. Add the reserved liquid from the clams and mussels. Pour over chicken and rice mixture, steer and simmer for about 15 minutes. Arrange shrimp, clams, and mussels over the top, and garnish with strips of pimiento and cooked artichoke hearts. Cook in moderately hot oven for about 15 minutes. Liquid should be absorbed; you can add more during cooking if necessary.